As I have been babbling to my friends for months, I am flying to New York City on the first Saturday in May. I’ve seen the movies and read the stories, but I’m sure the city is bigger than I can imagine. I come from a place that’s likely smaller than many can imagine. New York is the big town for big dreamers, the destination for those yearning to be free, the global hub of culture and commerce. It's Times Square and the Empire State Building and Central Park and Ground Zero and the Statue of Liberty. As of the most recent population figures I could find, New York City has about 8.4 million people, with a metro area of 19.1 million. I’ll be staying in Manhattan. Can’t wait to see what 4,253 Gilman Citys crammed into its 23 square miles looks like. I grew up in a county without a traffic light (not counting blinking red lights); New York City has about 12,000 traffic lights. So, yes, it will be an adventure. I think it’ll be fun. I’ll get to see my friend Brenna, whom I respect a ton, a young woman who is unmistakably “going for it" in the biggest arena of them all. There are a lot of iconic things to see and do in the Big Apple. One of the most exciting will surely be seeing a baseball game in Yankee Stadium. The Yankees win. Or rather, “Thhhhhe YAN-kees win!” as their announcer yells/taunts. Of course they do. They are U.S. Steel. They are Standard Oil. They are the United States of America. They are the portrait of professionalism, poise, pride. Reggie “the Straw That Stirs the Drink” Jackson and the swashbuckling Nick Swisher aside, they are largely dignified, close-cropped, singularly focused. They don't mince words about being big-spenders. They are hated, loved, overcovered. Since, oh, 1920, they have been arguably American sports’ only true dynasty, pretty much marching relentlessly from Ruth to Gehrig to Dimaggio to Mantle to Jackson (to Mattingly?) to Jeter. They have won 27 World Series titles and 40 American League pennants, each more than twice as many as any other team. In the 1920s, Murderer’s Row was born. The 1927 Yankees are still viewed by many as the greatest team ever, going 110-44 (yes, they won 110 games with a 154-game schedule). They outscored their opponents 975-599. Babe Ruth hit 60 home runs. They swept the Pirates in the World Series. On and on it went. Lou Gehrig said he considered himself the luckiest man on the face of the earth even as he had the disease that would bear his name. Joe Dimaggio hit in 56 straight games, became larger than life with his grace and skill, and was included in Hemingway books and song lyrics to symbolize a particular era in American life. Jerry Coleman broke Boston hearts in 1949. The Yankees tormented the cross-town Dodgers. Mickey Mantle almost hit a ball out of the massive Yankee Stadium. Yogi Berra had a way with words. The Stadium became the wild “Bronx Zoo” in the 1970s. Bucky Dent broke Boston hearts in 1978. There was a 15-year pennant drought. The Yankees roared back in the post-strike era. America actually rooted for the Yankees in the electric 2001 World Series. Aaron Boone broke Boston hearts in 2003. They won the title again in 2009, the last World Series of owner George Steinbrenner’s lifetime. The original Yankee Stadium, open from 1923 to 2008, was so often the home office for October baseball. To see it as Ruth saw it, or even as Jeter saw it, would have been great. Fortunately, the new Yankee Stadium, big, opulent, expensive, incorporates many elements from the original. 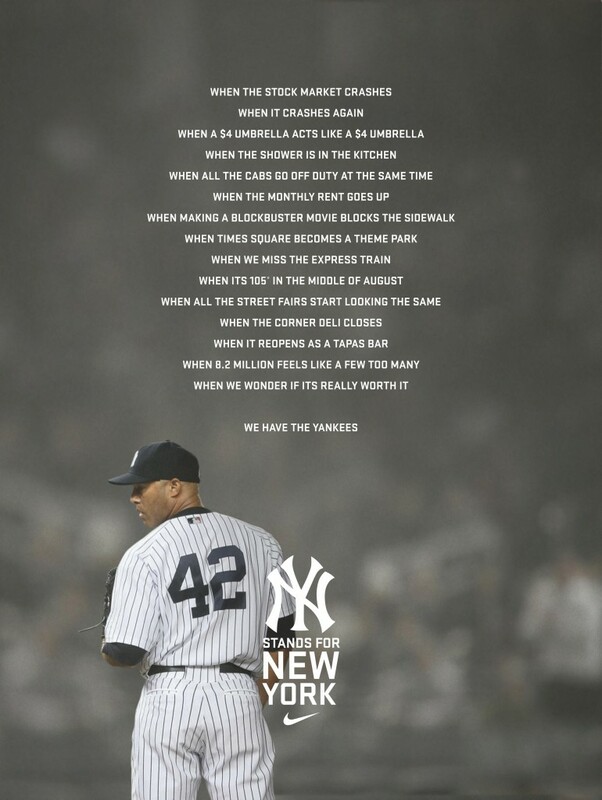 As Jeter said at the last game in the older stadium, they took the tradition across the street. Bizarrely, I almost feel like it will be familiar to enter the Stadium. Much of my formative baseball experience involves watching playoff baseball games at Yankee Stadium, back in the good old days when Fox had all the games. October was sensational for a sports kid with network television. Like everyone, I got goosebumps watching those World Series games in 2001, when mystique and aura were not “dancers in a nightclub,” as Arizona Diamondback pitcher Curt Schilling said, but a real, almost living part of Yankee Stadium. With Ground Zero still smoldering, with hearts still in throats, a largely past-its-prime Yankees roster captivated the nation. Game 3: President Bush became the first sitting President since Eisenhower in 1956, firing a strike from the mound. Seven innings of Roger Clemens, two innings of Rivera for a 2-1 Yankee win. Game 4: On Halloween, Arizona took a 3-1 lead into the bottom of the ninth. With two out, Tino Martinez hit a two-run, game-tying homer off Byung-Hyun Kim. Then, in the 10th inning, Jeter hit an opposite-field, game-winning homer. My favorite sportswriter, Joe Posnanski, has called it the greatest baseball moment of his life. The crowd at the Stadium sang, “New York, New York,” over and over afterward. Game 5: Lightning struck twice. With two out, down two in the ninth, Scott Brosius blasted a two-run homer to tie it, raising his fist triumphantly in the air almost immediately after hitting it. Yankee Stadium roared and roared and roared. The Yankees later won the game with a walkoff Alfonso Soriano hit in the 12th. The gritty Diamondbacks ended up winning the great Series in seven games, but those three games hold a treasured spot in the attic of the memory for baseball fans and for Americans. It seems almost impossible to believe now, but the Royals and Yankees were rivals, or something like it, in the late 1970s and early 1980s. Four times in five years, the two teams, the mighty Yankees from Gotham and the fiery Royals from Cowtown, clashed in the American League Championship Series with a berth in the World Series on the line. In 1976, the Yankees won the best-of-five series with a walkoff homer by Chris Chambliss in Game Five. The Bronx Zoo of fans spilled onto the field, and Chambliss dodged through the bedlam to circle the bases. Royals fans might point out Chambliss never touched home, avoiding the mob there. He later went back to touch it, but it had been stolen. The Yankees again prevailed in five in 1977, beating the winningest Royals team ever, and won again in 1978, this time in four games. Finally, in 1980, Kansas City broke through when George Brett smashed an upper-deck homer off Goose Gossage, completing the sweep. Years later Steinbrenner referenced this homer when Brett asked, “Why do you hate me, George?” The highlight and Brett’s “in-your-face” home run trot are frequently replayed to this day at Kauffman Stadium. No less replayed is the Pine Tar Game, when Brett hit a home run at Yankee Stadium but was then called out for having too much pine tar on his bat. As Yankee manager Billy Martin asked the umpires about the bat, Brett said, “If they call me out I’m gonna kill those…” (You can imagine the rest.) Brett didn’t kill anyone, but he had to be carried/dragged screaming off the field. The commissioner later overturned the decision, and the last inning of the game was replayed, with Kansas City winning. The bullpen gate swings open. A 41-year-old pitcher from Panama trots out. The chilling opening of Metallica’s “Enter Sandman” blasts over the Yankee Stadium speakers. He is slender, carrying himself and playing with that hint of elegance that Dimaggio displayed. The game is almost always over when he comes in. Armed with a single spectacular pitch, his legendary cutter, he defines the best the closer role can be. No fake energy or theatrics (he didn’t know that “Enter Sandman” song; the Stadium sound people just started playing it), just that calm and those results. Bring on the Sandman. Go to bed. Rivera’s in; this one’s over. I hope to see this scene. I admire Rivera’s calm no matter what happens, his religious devotion, his dignity. I also admire his skill: career numbers of 566 saves, 2.23 ERA, 1.003 WHIP. And, while he won’t pitch forever, he still seems as good as ever this season and last year. He is The Great Rivera. It’s surely obvious now, 1,400 words in, how excited I am to make this trip. New York’s a city for the dreamers, whether you’re a girl from Farmington working for Goldman Sachs in Lower Manhattan, a guy from Michigan making the Stadium shake with a winning homer, or a slender Panamanian mystifying the best hitters on earth. Or a kid from Gilman City watching his Royals in Yankee Stadium.